It’s possible to rent office space to one of your other businesses, but you must correctly engineer the arrangement since it’s not a traditional arms-length transaction. Can I rent office space to myself? Yes. 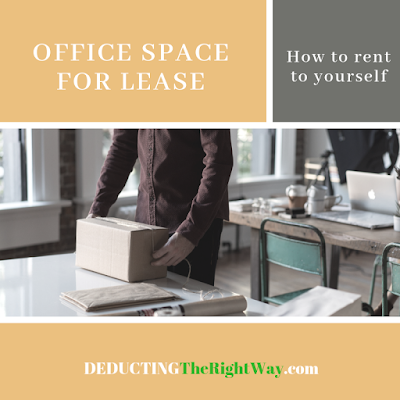 You can be both the landlord and tenant if you own a building or office, and you also operate another business that wants commercial space for lease. However, since you sit on both sides of the table, you need to take precautions to pass IRS scrutiny. How does renting to myself work? The landlord (you) has a written lease with the tenant (your other business). The document contains market rent, and you receive a security deposit from your other company. The written agreement has a late fee and a standard rent increase. Most importantly, the tenant pays the monthly rent on time. The landlord pays tax on the rental income while the tenant deducts the expense. What happens if I don't comply with the self-rental rules? If the IRS later rules that the transaction is not reasonable or a sham, then it can be reversed during an audit. Why? Because your (tenant) company was trying to reduce its income by using a rent deduction that didn't comply with the guidelines. When this occurs, the company will owe the additional tax that would have been due and payable, plus penalties and interest. TIP: The landlord and tenant must be separate businesses (each having their own tax return or Schedule C/E, whichever applies). \nCan I rent office space to myself? \nYes. You can be both the landlord and tenant if you own a building or office, and you also operate another business that wants commercial space for lease. However, since you sit on both sides of the table, you need to take precautions to pass IRS scrutiny. \nHow does renting to myself work? The landlord (you) enters into a written lease with the tenant (your other business). \nIf the IRS later rules that the transaction is not reasonable or a sham, then it can be reversed during an audit because your (tenant) company was trying to reduce its income by using a bad rent deduction. When this occurs, it will owe the additional tax that would have been due and payable, plus penalties and interest. \nTIP: The landlord and tenant must be separate businesses (each having their own tax return or Schedule C/E, whichever applies).